Pilates Reformer is a mindful workout that improves many aspects of daily life such as posture and improved mobility. This fitness routine builds muscle, increases flexibility, coordination, and balance. Lots of people come to this class to ease joint pain, build muscle, and get flat abs. These are definitely achievements you can gain in this class, but there is much more to this class than flat abs and strength building. This class builds all muscle groups leading with the core. With this class, you will be strengthening and using every muscle in the body even those in the ankles and feet. Many other exercise classes use the same muscle groups every time. 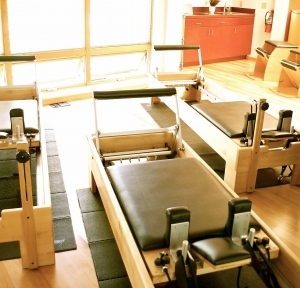 What is the Difference Between Pilates and Pilates Reformer? Pilates Reformer is different than pilates on the mat. With the machine, there is more resistance to the movements and works the muscles in a larger range of motion. The machine is able to accommodate injuries more proficiently and conditions the whole body in a more challenging way than on the mat. MUUV Yoga Boise offers six classes a week. Classes are led by our instructor Jenny Lewis. Monday and Wednesday 8:15 a.m and 9:15 a.m.
Thursday 7:45 a.m. and 10:30 a.m. The class holds three people per session. Currently all our classes are full, but we are taking names for those who would like a full time weekly spot, or are interested in being a fill-in person for weekly classes. To schedule, contact our studio here. Private lessons cost $75 for a one hour session. Please contact the studio to schedule your session.